I cannot abide by butter tarts with raisins in them -- I mean, REALLY, they're called BUTTER tarts not RAISIN tarts, amirite? Frustrated by sad grocery store tarts with soggy pastry and bakery ones filled with raisins, I finally started making them myself a few years ago. This recipe makes 3 dozen tarts. You will either need 600g pie pastry or 3 dozen unbaked pre-made tart shells. It is easy to make and goes together quickly. Preheat oven to 375F.Melt the brown sugar and butter together in a saucepan over low heat. Set it aside, and allow the mixture to cool slightly.Whisk together the eggs, cream, vanilla, salt, and cinnamon. Combine with the sugar mixture.Line tart pans with pastry. Fill unbaked shells 2/3 full. Bake for 18-20 min.Let the tarts cool in the pans on a wire cooling rack. After 5-10 min, gently spin tarts to avoid sticking. 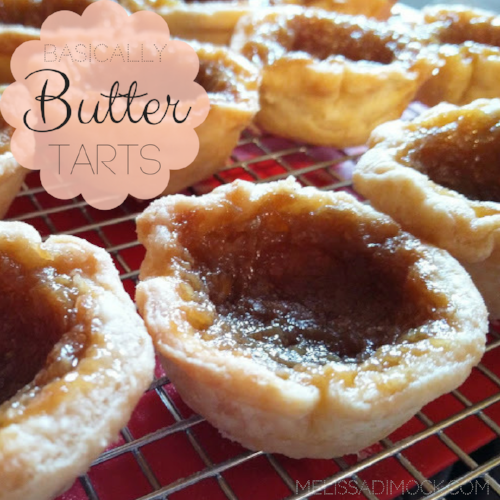 Remove from tins and finish cooling on racks.Store cooled tarts in an airtight container for up to 1 week.